Our vacation to Turks and Caicos last week was wonderful. Just what we needed. Doug and I spent a lot of time eating delicious food, walking on the beach, swimming, getting massages, reading, and watching old episodes of The Bachelor on our iPad. Brief explanation on that last one: Doug and I share a secret passion for The Bachelor/Bachelorette. It is one of those dorky things we do as a couple. We only started watching a few seasons ago and now download "vintage" seasons on our iPad to watch on flights/in hotels. This trip we followed the demise of Jake and Vienna. Don't judge. There was so much amazing clean food on our trip! From green juices, to smoothies, to amazing salads, to raw entrees, to macaroons. I was in culinary heaven. I will share photos of all of it this week. However, before I get to what I ate on vacation I wanted to share some of my tips for staying healthy while traveling. No matter how exciting your destination, travel can be exhausting and taxing on the body. Knowing that airplanes are extremely dehydrating and airports are a healthy food wasteland I like to be well prepared. 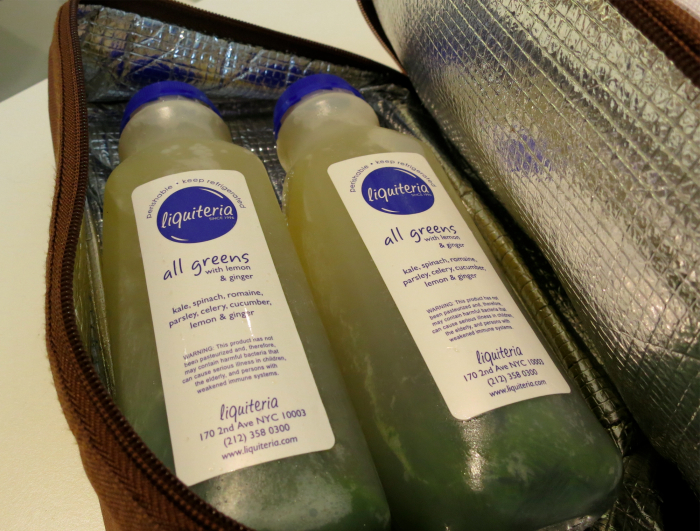 The night before I get on any airplane I freeze a few bottles of green juice for the trip. As long as they are sealed and frozen solid (i.e not a LIQUID or GEL) the TSA cannot take them away. I always love the look on their faces when they search my bag only to realize my juice is frozen solid! By the time I arrive at my destination my juice is usually defrosted and ready to drink. After a super dehydrating flight I am so happy to have my green juice! For longer trips where I know I will have access to a fridge I will often pack up to six frozen juices in a cooler bag in my checked luggage. I have a great little cooler bag that I got at Whole Foods. The bottom is the perfect compartment for frozen juice, and the top has plenty of room for snacks. I always pack a few apples to eat on the plane, dark chocolate bars for dessert, and a few nut/dried fruit snacks in case of emergency. While most airports are usually void of any food I would want to eat, on this trip I was pleasantly surprised. I discovered these delicious Simple Squares at the JetBlue terminal at JFK! They were so delicious. Made with honey, almonds, cashews, coconut and spices they were the perfect purse friendly snack! I love that even airports are getting healthier these days. As long as I have some green juice, fruit, chocolate and emergency snacks I know I can tackle any long travel day without getting hangry! Another useful trip for avoiding airplane dehydration: drink 8 oz of water for every hour you are on the plane. I know it sounds like a lot but trust me it's worth it. It is much easier to stay hydrated than to recover from being dehydrated!